A technology developed at Oak Ridge National Laboratory could streamline and strengthen the process for siting power plants while potentially enhancing the nation's energy security. Oak Ridge Siting Analysis for power Generation Expansion, or OR-SAGE, divides the United States into nearly 700 million 2.5-acre cells that can be studied to determine if they are candidates for one or more types of electric power plant. This tool was used to produce results presented in a 152-page report prepared by the Department of Energy's ORNL for the Electric Power Research Institute and allows for quick screening and characterization of potential sites. "OR-SAGE is a dynamic visualization database that allows us to look at the entire country through a lens," said Olufemi Omitaomu, a researcher in ORNL's Computational Sciences and Engineering Division. "The technology provides assistance working with real-world constraints." Omitaomu and colleagues Gary Mays and Randy Belles emphasized that OR-SAGE is not a substitute for a "boots on the ground" detailed inspection of a given site, but the tool provides much information regarding numerous screening factors and considerations without having to visit a site. "OR-SAGE takes into account availability of water, identifies sufficient land areas that are suitable to meet nominal requirements for the footprint of the various types of plants and impacts on siting future plants in terms of increases in population and demand for water," said Mays, project manager and a member of ORNL's Reactor and Nuclear Systems Division. "Ultimately, the tool allows for the flexible use of screening criteria for candidate site comparisons and enhances the ability to assess energy needs." A previous project that ORNL completed for DOE's Office of Nuclear Energy focused on siting nuclear power plants and provided the basis for developing the OR-SAGE methodology. 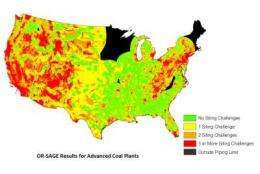 For this EPRI study, OR-SAGE also was used to examine advanced coal with carbon capture and storage, solar and compressed air energy power plants. Together, these studies are helping to identify hundreds of potential areas for power generation in the United States. A key driver for this work is the fact that by 2035, 4,775 billion kilowatt hours of electricity generation will be needed to meet annual energy demand in the United States, according to DOE's Energy Information Administration. This represents an annual increase in demand of 0.8 percent. Experts expect the additional electricity to be provided by a mix of power generation plants, and this report provides EPRI and other research groups with a tool to inform their analyses. OR-SAGE, which utilizes geographic information system data in addition to ORNL's LandScan, the world's most advanced population database, examines millions of cells and simultaneously determines their suitability for the various types of power generation. "With this study and resulting tool we are able to identify candidate sites for a variety of electrical generation plants and further characterization of these sites," Belles said. "We can evaluate for any given prospective site which type of plant is best suited, how far it is to transmission assets and the distance to underground geological formations suitable for carbon sequestration." The researchers noted that nuclear power plants share some of the same siting considerations as advanced coal. For example, both need to be within about 20 miles of a large body of water to meet cooling needs. In making siting decisions, OR-SAGE also takes into account population density, protected lands, seismic activity, terrain, proximity to airports, military bases, oil pipelines, refineries and a number of other factors. The attached map presents one result characterizing areas that are suitable or have some number of siting challenges for advanced coal plants using geologic storage for carbon emissions. Siting challenges are relative to the selected screening criteria and values. The siting process is complicated by the fact that the generation source identified as being the best is not always located near load demand, Mays said. Such situations necessitate a coordinated energy policy to generate and deliver power where it is needed. Results of the study show potential electric generation capacity of 158 gigawatts for advanced coal, 60 gigawatts/18 gigawatts for dry-cooled and water-cooled concentrated solar, respectively, and 515 gigawatts for large reactor plants.